o r are you just too busy doing? The person who is too busy to think never comes to understand what he or she should be doing. There is a very old story about the logger who is just so busy chopping down trees that he does not take the time to sharpen his axe. It becomes harder and harder to chop the trees so he quits. 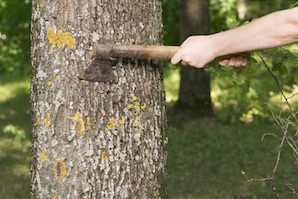 Then, there is the logger who spends all of his time sharpening his axe so it will be perfect when he starts to chop, but he never gets started and he quits. Which are you? We need to be a combination of both; we must learn to think. I call it, "gathering awareness." After we have gathered, we need to take action based on our thinking. It is an integrated methodology. I call thinking contemplation; it is almost a lost art today. You see, we don't really contemplate, instead we think, we plan, and plan, and plan. The mistake is we think planning is thinking when in fact it is merely connecting. For example: In planning, we have the tendency to compare things such as our success last year with our success this year. Well, that means that we are connecting our thinking with how well or how poorly we did last year which has nothing to do with our full unrealized potential. Contemplation does not compare, it unpacks the potential based on gifts and competencies. Recollect them, contemplate, and you will discover things about yourself and your environment that you never dreamed possible. The truth is that the Divine wants more for you than you will ever want for yourself. Turn your thinking through recollection and contemplation over to the energy of the Spirit that is bigger and infinitely more expansive than you will ever be. Recollection is the ability to stop, capture the moment and withdraw from the activity that surrounds you. It is the act of spending time in concentration (contemplation) of the depth of the moment, the idea, the thing, so that clarity of its value and connective capacity come into focus. The mind is likened to a train of boxcars speeding by; rushing on quickly out of site and out of mind. Recollection is the act of seeing one boxcar, stopping the train and getting into that particular box car. When you stay in that box car (one thought), you can better see its relative value, its Divine value, its connectivity to what is happening in your life and work. You have turned the river of reflection into a well of understanding when you do this. You have achieved contemplation where the Divine intent for your life can come into recognizable view. Thom shares that ideas without actions are a dead end to the purpose of your life and work. Actions are the fruit of ideas. Thom will share how you are inspired in reflection and confirmed in act.